When the light’s just right, your floor looks awesome. The rest of the time it looks like the backdrop used in a film involving monkey’s rollerblading in the house. Even the highest quality floors are subject to gouges and scratches from dropped items, toys, items being dragged across the floor and so many other daily forms of abuse. 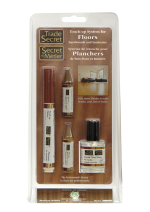 The Trade Secret Touch-Up System for Floors is designed specifically for flooring applications to ensure a durable and long-lasting repair to worn, scuffed, scratched and gouged areas. 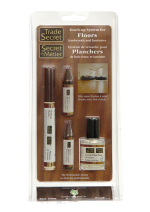 By combining the Trade Secret Fill Sticks, Pro Touch-Up Markers and Pro Finish in one handy kit, you can fill, stain and finish, with stunning and robust repair results. Our 5 colour assortment allows you to tackle most flooring finishes and industry colours. Fill deep nicks and gouges with the two tones of wax Fill Stick, shade and tone with the Pro Marker and make your repair permanent using the water-based, low VOC Pro Finish. The System components can be used with each other or on their own depending on the job. Don’t let the rollerblading primates rule your world. Water-based Pro Finish to seal Fill Stick repairs or to simply be used on its own for clear fills that adheres even to the hardest of finishes.